Since the implementation of the European Directive on Takeover Bids, a European common legal framework governs regulation of takeovers in EU Members States. The European Directive on Takeover Bids was adopted in April 2004, and implemented in the UK and in other Member States on 20th May 2006. The Directive seeks to regulate takeovers by way of protecting investors, and harmonising takeover laws in Europe. In facilitating the restructuring of companies through takeovers, the Directive aims at reinforcing the free movement of capital. 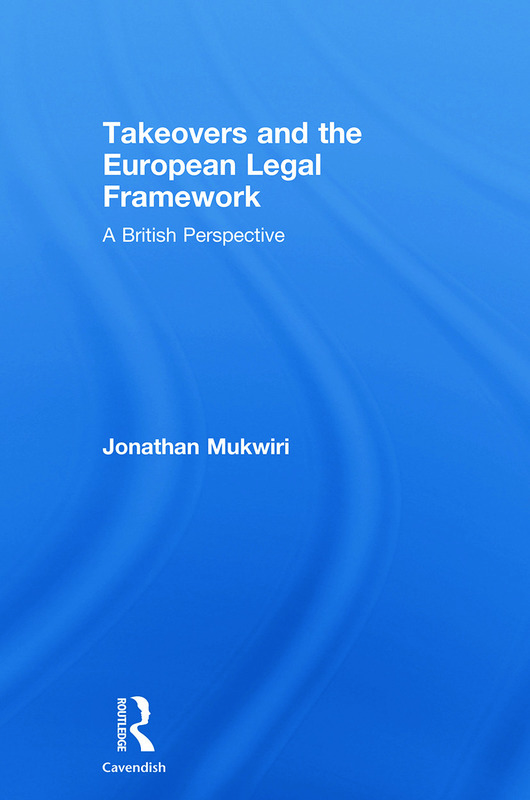 Takeovers and the European Legal Framework studies the European Community Directive on Takeover Bids, in order to provide greater understanding of both the impact and effect of the European legal framework of takeover regulation. It firstly looks at the Directive from a British perspective, focusing on the impact of the transposition of the Takeover Directive into the UK. The book examines the provisions of the City Code on Takeovers and Mergers, and discusses the takeover provisions in the Companies Act 2006 that implement the Takeover Directive in the UK, arguing that the Directive will provide a new basis for UK takeover regulation, and that the system will work well. Jonathan Mukwiri goes on to consider the Directive in relation to the EU, arguing that despite its deficiencies, in that Member States are free to opt to restrict takeovers, the Directive provides a useful legal framework by which takeovers are regulated in different jurisdictions. Mukwiri highlights how the freedoms of the EC Treaty and EU Directives interact, and the effects of the Takeover Directive on political considerations in the law-making process in European Community. Moreover, he argues that the future of EU takeover regulation is likely to follow the lead of the UK, making this book relevant to a wide range of policy makers and academics across Europe.